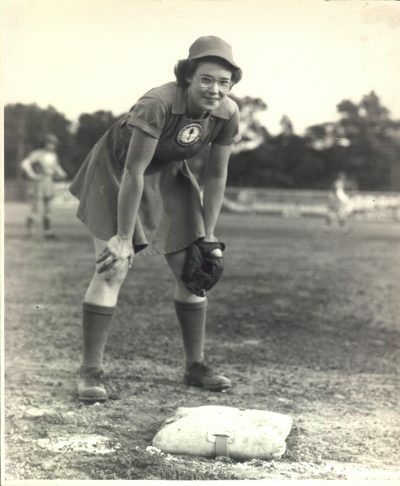 Arleene Noga, affect ionately known as “Johnnie”, an outstanding player with the Muskegon Lassies of the All American Girls Professional Baseball League earning the title “The Iron Lady”, accumulating a grand total of 339 consecutive games played in the years 1946, 1947 and 1948, died Tuesday, March 14th in Regina at the age of 93. Having been raised a softball player in and around the small, rural town of Ogema in southern Saskatchewan, Arleene went back to playing and coaching softball upon her retirement from the AAGPBL. However, her athletic accomplishments did not stop there. For years, as a proficient curler, she skipped and played on many championships rinks, also finding time to become an excellent bowler as well. She accomplished many of these athletic endeavours while working full time for the Saskatchewan Government in Regina and raising a family as well. Over the years her interest in these sports, especially softball, kept her in demand at coaching clinics and baseball schools from British Columbia to Halifax. One of her greatest contributions to baseball had been as an active member of the All American Girls Professional Baseball League Players Association since its inception in 1987, having spent a number of those years as the Canadian Representative. Later, Arleene received the Certificate of Appreciation from the Players Association for her twelve years of service on the Board. 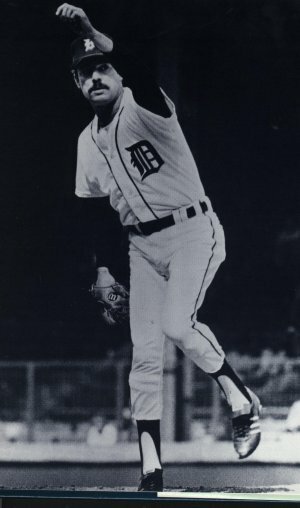 Arleene was inducted into the Saskatchewan Baseball Hall of Fame in 1988 and a year later was accorded induction into the Saskatchewan Sports Hall of Fame. 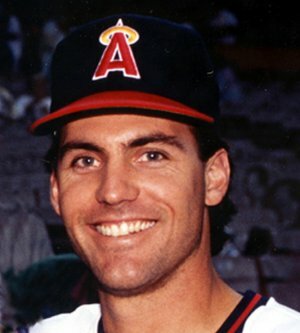 An induction of all the Saskatchewan-born All Americans into the Saskatchewan Baseball Hall of Fame was held on April 6, 1991 in North Battleford, SK. In 1992 Arleene was engaged by the producers of the film “A League of Their Own” to act as one of the technical advisors. One of her assignments was to teach Rosie O’Donnell how to play shortstop and to demonstrate to Madonna the proper way to slide into third base. Near the end of the film, Arleene, along with other former AAGPBL Canadian players can been seen playing in a reunion game on Doubleday Field in Cooperstown, NY. Then, after the nomination was accepted on the first ballot, on Thursday, June 4, 1998 Arleene Johnson Noga along with 63 other Canadian-born players who had played in the All American Girls Professional Baseball League at some point during its 14-year history, were formally inducted into the Canadian Baseball Hall of Fame and Museum in St. Marys, ON. Later that evening a banquet was held where Arleene, as the Players Association Canadian District Representative, spoke on behalf of the other players and formally thanked all who had participated in making a most memorable day for each of them. In the preparation by the nominator of the 80-page nomination of the 64 Canadian All American players, Arleene was most instrumental in supplying a wealth of material on all the players, especially those whose whereabouts were known as she had kept in touch with so many of them as their Canadian Representative. March 26th, 2002 saw the World Premier of the documentary “All For One, The Story of Canada’s All American Baseball Girls” on TV. 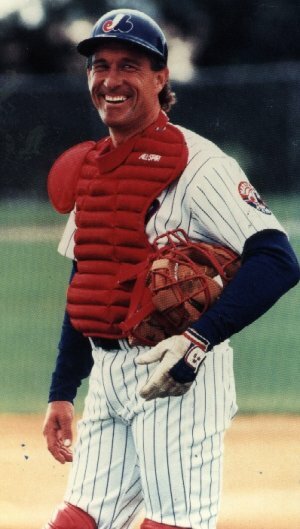 The film featured interviews with Arleene along with three other prominent Canadian players whose baseball experience were related through interviews, photographs and vintage film footage. As part of Women’s Day on August 31st that same year, the Toronto Blue Jays hung a giant banner of Arleene in her Muskegon Lassies’ uniform outside SkyDome while inside she threw out the first pitch in a game vs. the New York Yankees. Arleene went on to receive many more accolades including a personal tribute bestowed upon her when her hometown re-named their Ogema Grandstand, the Arleene Johnson Noga Grandstand on Saturday, July 10, 2004. Given the breadth of the enormous contribution she has made to baseball, softball and sports in general over a virtual lifetime, Arleene has rightfully earned her place in the annals of Canadian sport. Never one to seek the limelight, Arleene nevertheless gave tirelessly in promoting her passion for competition, always stressing ‘fair play’ especially whenever she spoke many times to school children of all ages. This quiet lady of integrity, patience and caring will truly be missed by both family and the world of women’s baseball to which she dedicated her life. Arrangements have been made with Speers Funeral Home for a Come and Go Celebration of Life to be held Tuesday, March 21, 2017 from 7:00 pm – 9:00 pm at the Speers Family Centre 2333 Cornwall Street in Regina. There will be an obituary in the Regina Leader Post on Saturday. A more detailed obituary will be posted on the Speers Funeral Home website: speersfuneralchapel.com.